Our torque converter fits a 3/4" shaft and comes with a 10 tooth sprocket for a 40/41 chain. It will work with small engines producing 5.5 HP - 9 HP. Q: Will this fit a carter brothers go kart model#1136-3019 ? A: In doing some research I found a manual for a Carter Bros #1136-3016, so hopefully your #1136-3019 has the same setup. According to the manual the stock version of torque converter on the that kart was Comet 20 Series. 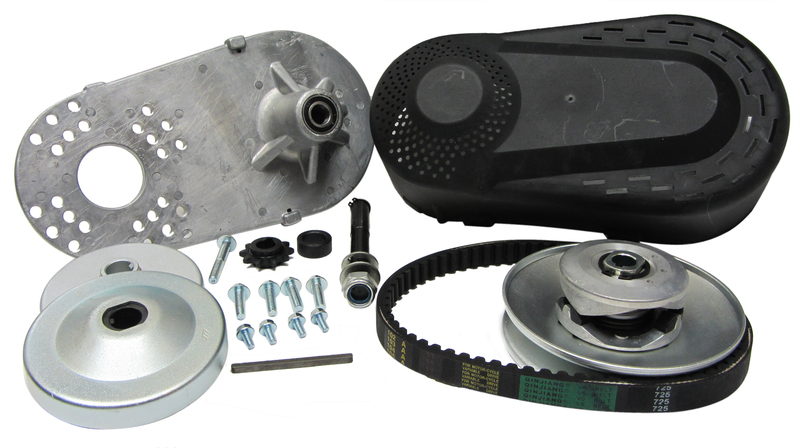 Q: I have purchased this item /Torque-Converter-for-41-Chain-34-Bore-TAV2-Replacement_p_1029 And need a replacement belt and belt clutch, do you have the part numbers? Thank you! Q: Is this torq conv good for a horizontal drive (out the side of the engine), or is it for a vertical or rear driveshaft? Q: I have a Briggs/Stratton engine, idles 1800. with a 10 tooth drive gear and 50 tooth driven gear, my engagement is too fast (current clutch engages at 2100). Does this torque converter have reduction ratios at engagement and then advance from there? Could i use this torq conv to regulate the speed better? 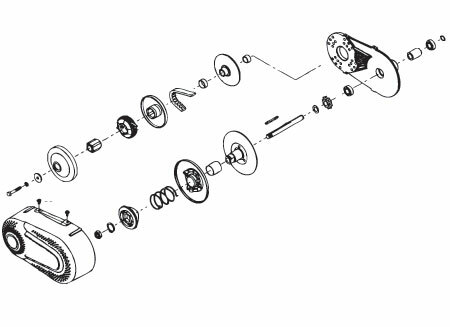 Q: What is the low end and high end gear ratio's on this torque converter? Low end around 2.68 ratio but what is high end? Is it between .90 - 1.15 ratio? Q: How do I tell if I have the #41 chain?? A: Use the chart listed here Standard Roller Chain Specifications. It will give you ways to measure your current chain to determine the size. Q: what's the # chain you sell for this torque converter and what sprocket ? Thank you. A: Chain sizes #41, 40, or 420 will work with this Torque Converter, and any corresponding sprockets to those chains sizes will work also. A: Yes this fit a 212cc Predator engine. Minibikes normal run a larger chain size, like #420, #40 or #41. This Torque Converter is compatible with all three sizes. Q: I have a comet 20 torque converter will this package fit what I need it for the belt I have on it is a Oregon part# 75-368 belt if that helps at all and the engine is a 6.5 vanguard engine thank's ?